Channel 4 said the programme was "sympathetic and humane"
More than 5,000 people have signed an online petition calling for Channel 4 to drop its TV show Benefits Street. 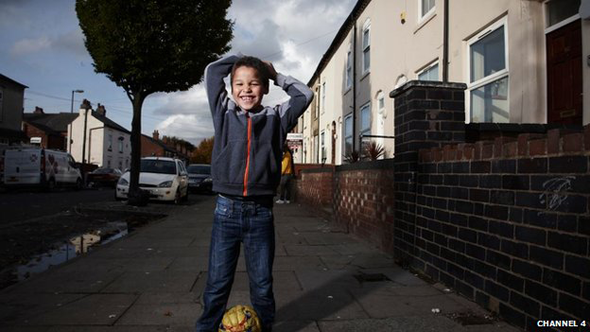 The programme started on Monday and follows the lives of people on James Turner Street in Winson Green, Birmingham. Some residents who feature in the show claim the programme makers have portrayed them negatively. But Channel 4 said the programme was "fair and balanced" and they had no plans to withdraw it. Former Birmingham resident Arshad Mahmood started the petition, calling for the five-part series to be stopped. "I'm really surprised with the reaction to the petition. It's doing pretty well," he said. He said he had started the petition because he felt uncomfortable after reading details on social media of threats of violence against some of the participants. Mr Mahmood added he had been raised on benefits in the city. "These are marginalised people with complicated situations being exploited for entertainment, and the thousands who have signed my petition agree with me," he said. Channel 4 said the programme had attracted its highest viewing figures in more than a year - 4.3 million. Broadcasting watchdog Ofcom said it had received hundreds of complaints about the programme, which is due to end in February. "At the end of the day it's up to Channel 4 whether they axe this show," said Mr Mahmood. They should make a donation to local community groups so at least something good comes out of it." However, one of the show's participants, Smoggy, said he had no regrets about having appeared on the show - and that he had been offered three jobs since appearing on it. "Since being on the TV I have had a lot of nice people get in touch," he said. A Channel 4 spokesman said the documentary was "a fair reflection of the reality of life on a street where the majority of households receive benefits". He added: "It is a sympathetic, humane and objective portrayal of how people are coping with continuing austerity and cuts in benefits."